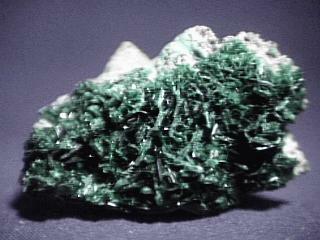 Torbernite is a popular mineral among collectors who seek uranium bearing minerals. Its square tabular crystals are distinctive, but might remind someone of the mineral wulfenite, if not for the green color of torbernite. Autunite is a structurally related mineral that also forms square tabular crystals, but they are not typically solid green and autunite is fluorescent in UV light. The structure of torbernite is composed of phosphate tetrahedrons linked to uranium-oxygen groups that form distorted octahedrons. The phosphates and uranium groups lie in sheets that are weakly held together by water molecules. This structure produces the tabular habit, the one perfect direction of cleavage and the relative softness. Torbernite can lose water and convert to a different mineral called meta-torbernite of the meta-autunite/meta-torbernite group of minerals. The change to meta-torbernite will often produce a pseudomorph. A pseudomorph is generally an atom by atom replacement of one mineral's chemistry to form another mineral. The process leaves the crystal shape of the lost mineral intact. Pseudomorph means false (psuedo) shape (morph). In this case, the conversion is not so dramatic since it involves only the loss of a few water molecules and therefore a good pseudomorph is likely. The conversion is irreversible and ongoing and all collection specimens of a certain age are almost certainly partially to totally converted. The presence of torbernite crystal has been used by prospectors as an indicator of profitable uranium ore in the area. Fine torbernite specimens should be stored in a closed container to avoid water loss. Remember, this is a radioactive mineral and should be stored away from other minerals that are affected by radioactivity and human exposure should be limited. Colors are various shades of dark to light green. Luster is vitreous to pearly on the main pinacoid. Transparency crystals can be transparent but more commonly are translucent to opaque. Crystal Habits include tabular square crystals dominated by two pinacoid faces. Crystals can look cubic, but the pearly luster only on the pinacoid faces gives the true symmetry away. Crystals can form in parallel growths giving a "stacked book" kind of look. Also as crusts, micaceous, foliated and scaly aggregates. Streak is a pale green. Associated Minerals are autunite, uranophane, uranocircite, meta-torbernite, uraninite and other uranium minerals. Other Characteristics: radioactive and cleavage sheets are not bendable but are in fact brittle. Notable Occurences include Cornwall, England; Mitchell Co., North Carolina and Utah, USA; Shaba, Zaire; Germany and France. Best Field Indicators are color, crystal habit, non-fluorescence, radioactivity, associations and brittle cleavage sheets.